Let's face it, most robots are big, expensive, and clunky. At Universal Robots, we have developed a highly specialized, low-cost robotic arm to streamline your production process. Like an extra colleague, the robot can work right alongside employees with no safety guarding. The user-friendly software is a cinch to learn, and installation can be done in under an hour. Our UR5 robotic arm was named "The world's most innovative robot" by The International Federation of Robotics and IEEE Robotics and Automation Society in 2012. Learn more about Universal Robots' robotic arms and see them in action. Army researchers are responding to a request from the U.S. Special Operations Command (SOCOM) for technologies to help develop a revolutionary Tactical Assault Light Operator Suit (TALOS). TALOS is an advanced infantry uniform that promises to provide superhuman strength with greater ballistic protection. We haven't heard from Liquidmetal Technologies in quite a while, but the Rancho Santa Margarita, Calif.-based company known for its injection-moldable, high-end bulk metallic glass material seems to be making a real push in 2013 to do some customer outreach. For the next generation of commercial jets, researchers are looking to even stronger and lighter materials, such as composites made with carbon fibers coated with carbon nanotubes. But a significant hurdle to making these composites lies at the nanoscale. Want an extra 200 hp from your 250-hp Audi S4? A.W.E. Tuning's RSK04 performance package kit, along with an A.W.E. Tuning performance exhaust system, will do the trick. But where to put the aftermarket turbo boost gauge that monitors the system? Engineers at A.W.E. Tuning turned to Protomold to develop an in-dash integrated design. 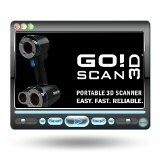 Creaform's Go!SCAN 3D is a simple, portable, and affordable 3D scanner that lets engineering users effortlessly capture the 3D shape of any object, including complex, freeform, and organic shapes. Dynamic referencing makes it possible to move the part during scanning, keeping the accuracy level up to 0.1 mm. This is a really slick tool that lets you scan using a super-easy spray-paint style for accurate reverse-engineering or prototyping models. Mechanical and electrical engineers often overlook important issues when specifying their respective parts of an electromechanical system. Consider these five targeted pieces of advice for mechanical engineers responsible for electromechanical systems, as provided by an electrical engineer. By Dan Throne, Bosch Rexroth. Perfect for critical applications in automotive assembly plants and the like, Cicoil's highly durable Flexx-Sil Flat Cables are the optimal alternative to cumbersome round cables, unprotected wire harnesses, and space-consuming cable carriers. In addition, these highly flexible cables are designed to provide premium current-carrying capacity, excellent heat dissipation, consistent electrical characteristics, weight and space savings, and meet the reliability requirements of continuous motion, welding robots, and automation assembly systems. PEM spinning clinch bolts for use in thin metal sheets introduce one-piece captive screw solutions whose controlled clinching action during installation permanently captivates the screw while allowing it to spin freely in the sheet. This allows for quick attachment of mating hardware and reduced need for loose fasteners (such as screws and retaining clips or washers). These fasteners can serve as cost-effective alternatives to multi-component fastener assemblies. The product line includes Type SCB fasteners with an unthreaded neck for axial float, Type SCBJ hardware integrating a jacking feature, and Type SCBR versions with a self-retracting feature enabling the captive screw to remain retracted when engaged. Applimotion offers many of its brushless direct-drive motor kits and assemblies for vacuum applications. Light-vacuum applications employ Ni-plated magnets and potted coil assemblies. High-vacuum applications employ laser-welded, helium-leak-tested stainless housings. Applimotion's linear arc "LARC" motor kits excel at large diameters and low-profile applications with through-hole requirements. A derivative of air-core linear motor technology, they provide zero cogging for the ultimate in smooth rotation. LARC motors cover 200-mm diameters up to applications greater than 1-m diameter. The modular nature of these motors, (offered in arc segments), allows them to integrate into large assemblies for scanning, imaging, and metrology applications where size requirements take priority over high torque requirements. 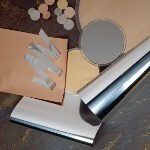 Microfoils as thin as 0.00025 mm are among the many foils available from Goodfellow for research and product development. More than 50 pure metals and approximately 100 alloys are represented in the company's full line of foils, with some of them -- rolled or deposited in Goodfellow's own production department -- not available from any other supplier. Custom fabrication and finishing are also often available to meet customers' precise specifications. Applications for foils are wide ranging and include their use in medical devices, aerospace technology, electronics, electromagnetic shielding, x-ray technology, alternative energy, and in many other scientific and industrial fields. Metal injection molding (MIM) is a popular choice in the flourishing firearms market for producing relatively high precision at a low cost. MIM combines powder metal with a low-melt polymer to create a feedstock that is molded using conventional injection-molding equipment and molds. After molding, the plastic must be removed and the parts sintered. The result is a solid metal part created from powder metal to near net shape at 96 percent density of wrought metal. Automotive supplier Continental's "driver focus" concept vehicle features driver-assistance systems that are linked to a highly versatile LED light strip to create an in-your-face tool against driver distraction. It's a full-surround, in-cabin light show -- and we're eager to get your opinion on it. Mechanical and electrical engineers often overlook important issues when specifying their respective parts of an electromechanical system. Here are five good pieces of advice for electrical engineers responsible for electromechanical systems, as provided by a mechanical engineer. By Jared Mann, applications engineer, Bosch Rexroth, Linear Motion and Assembly Technologies. Engineers at Minimizer, a manufacturer of plastic parts for the heavy-truck industry, road test their semi-truck fenders with functional prototypes 3D printed in black ULTEM 9085, a high-performance thermoplastic. They use a big Fortus FDM (fused deposition modeling) machine from Stratasys to make the testable prototypes. A Lockheed Martin F-35B Short Takeoff/Vertical Landing (STOVL) Lightning II test aircraft recently completed the first-ever Vertical Takeoff (VTO) on May 10, 2013. While not a combat capability, VTOs are required for repositioning of the STOVL in environments where the jet could not perform a short takeoff. 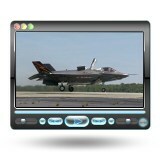 In these cases, the jet, with a limited amount of fuel, would execute a VTO to travel a short distance.